MBF Makes $77,500 Impact in 2017 and Kicks Off Campaign! Thank you! 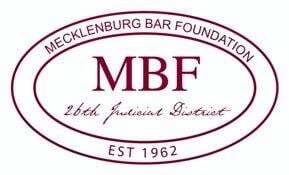 With your generous support, the Mecklenburg Bar Foundation (MBF) awarded 12 grants totaling $77,543 in early 2017. Before looking ahead to the 2017-18 Bar Foundation Fund (BFF) campaign, MBF is pausing to celebrate and express gratitude to the individuals, law firms, legal departments, and corporations that generously supported the 2016 Lawyers’ Impact Fund. This unrestricted fund allows the Foundation to support local legal nonprofits as well as the projects/initiatives of the Bar and Foundation. Assistance League of Charlotte: To support its Mecklenburg County Teen Court program. The Teen Court program is an alternative justice system that offers youthful offenders ages 12-17 with no previous convictions an opportunity to avoid a permanent criminal record and take responsibility for their actions before a jury of their peers. The program helps alleviate the large number of cases processed by the Department of Juvenile Justice. Teen Court can currently hear 176 cases each year. In 2015-16, Teen Court worked with 448 youth offenders. Volunteer teens provided 5,909 hours of community service. Council for Children’s Rights: To provide support for CFCP's legal representation and advocacy services for children in the areas of child welfare,custody, delinquency, mental health, and special education. CFCR defends and champions the rights of children to be supported and treated with fairness, compassion, respect, regardless of personal obstacles. Over 2,000 children in Mecklenburg County receive these specialized services each year. GenerationNation: To help support GenerationNation’s project offering teacher professional development, classroom curriculum and afterschool activities to educators and young people about the rule of law, legal issues and the legal system. GenerationNation utilizes hands-on activities and experiences to increase student knowledge and understanding. This project benefits 250 teachers and more than 50,000 students in 150 local schools. International House: To help fund the needs of the Ginter Immigration Law Clinic. The Ginter Law Clinic provides affordable general consultation, family immigration, and naturalization services for low-income immigrants in Charlotte. In addition, the Clinic provides family reunification assistance to immigrants and refugees who recently arrived in the U.S. and have little to no income. The Clinic serves low-income immigrants, refugees, and asylees who live in the greater Charlotte area and have annual income below 200 percent of the federal poverty guidelines. Over the past few years, the Clinic has seen increased demand for family reunification services. The Clinic expects to open approximately 650 cases for legal representation and 50 family reunification cases in 2017. Justice Initiatives: To help fund a research fellowship to conduct and publish the type of research that would be indicative of the work a judicial policy research center would produce in the area of judicial administration. JI is in discussions regarding the creation of a judicial policy research center and plans to have completed the groundwork needed toward institutionalization by FY 2019-20 should the concept be proven. Larry King's Clubhouse: To provide direct program-related consumables that are an integral part of a quality childcare program. The Clubhouse provides a safe, secure, and enriching place for children who must be at the courthouse because they are witnesses, they are the subject of child neglect or abuse or custody proceedings or their parents or guardians have business at the courthouse. The center offers quality care and developmentally appropriate activities for children, age 6 weeks-12 years, on all days that the court is in operation. Children are removed from environments where they might hear inappropriate and psychologically damaging testimony, their families’ access to justice is improved by addressing child care barriers, the efficiency of court operations is increased by removing distracting and disruptive activity and families are linked to needed community services. The center had 7,620 visits during fiscal year 2016. Legal Aid of North Carolina: To help fund a Housing Screener to screen the calls of tenant families seeking assistance when being threatened with eviction with the goal of preventing more homelessness in Mecklenburg County. LANC is a statewide, non-profit law firm that provides free legal services in civil matters to low-income people to ensure equal access to justice and to remove legal barriers to economic opportunity. The LANC-Charlotte office receives 20-40 new calls per day from tenants threatened with eviction. The Housing Screener allows LANC to screen more of the callers and accept the apparently meritorious cases, thereby serving more of these families by a combination of staff advocates and pro bono attorneys. Legal Services of Southern Piedmont: To support the Access to Justice Pro Bono Program. The program provides high-quality direct legal services to help low-income clients meet their most important needs for income, shelter, safety from violence, health care, education of children, fair treatment as consumers and equitable access to public and private benefits. These services are offered regardless of clients’ race, religion, ethnicity, national origin or immigration status. The pro bono program has grown dramatically since its inception. Pro bono case handling increased from 166 in 2009 to more than 500 cases in 2016. Pat’s Place: To help fund a social worker on the Forensic Interview Team. Pat’s Place Child Advocacy Center coordinates the investigation of reports to law enforcement or the Department of Social Services that a child may have experienced sexual abuse, serious physical abuse or neglect or when a child may have witnessed serious violence or a homicide. The forensics interview is the foundation of child protection and criminal investigations. In many child sexual abuse cases, there is no witness other than the child and often times, there is no corroborating evidence. The interview is a developmentally sensitive, non-leading conversation with a child that is intended to elicit detailed information about events that the child may have experienced or witnessed, and is conducted by masters-level, clinically licensed social workers who have received advanced training on the forensics of interviewing of child victims/witnesses. Pat’s Place serves Mecklenburg County children from birth through age 17. The Center anticipates conducting more than 600 interviews by the end of 2016-17. Safe Alliance: To help fund the salary for a full-time staff attorney working for their Legal Representation Project (LRP). The LRP provides free legal representation in hearings to obtain Domestic Violence Protective Orders as well as acting as a conduit to allow local attorneys to donate their time to victims. With a staff lawyer, Safe Alliance will be able to continue to represent more victims as well as assist in the training and mentoring of more pro bono attorneys. In fiscal year 2016, LRP provided legal representation to 383 clients, with 142 of those being served by volunteer attorneys. MBF’s Professional Assistance Financial Fund: To support five public interest agencies in Mecklenburg County (District Attorney's Office, Public Defender's Office, Legal Services of Southern Piedmont, Legal Aid of North Carolina, and Council for Children's Rights) to help offset the financial hardship associated with rising professional development costs for qualifying attorneys. MCB Diversity & Inclusion Committee: To support Pathways to Inclusion in the Law, the annual one-day conference engaging minority students in a discussion about the legal profession and law-related careers. Students hear about the role individuals with legal training play in everyday society, meet with attorneys, judges, law school admissions officers and law students, and have an opportunity to share their views of the law and lawyers. We are so grateful for the support of last year’s campaign, and we hope you will join us in growing our impact next year! In the words of Justice Initiatives, “There are very few foundations that appreciate and promote the importance of the rule of law and the role a healthy court system plays in safeguarding the foundation of our American system of government.” Our community’s at-risk populations – children, residents of low-income, immigrants, the unemployed, and displaced – continue to benefit greatly from the generosity of our legal community. But the need is still great. With your support, we can continue to make a difference. The Foundation will continue to call on the individual members of the Mecklenburg County Bar for support through unrestricted giving to the 2017-18 Lawyers’ Impact Fund. This fund allows the Foundation to provide the grants that support and enhance projects and organizations that have a legal nexus in the greater community. Because our grants do not typically provide essential general operating support for these organizations, we encourage every member of the Bar to contribute to the Lawyers’ Impact Fund and directly to our grantees’ annual fundraising campaigns. If you have any questions, please contact Foundation Development Coordinator Sydney Hammond at shammond@meckbar.org or MBF Development Committee Chair Rob Heroy at rheroy@goodmancarr.net. To see those that have already pledged their support for the 2017-18 campaign or to pledge your support, please click here. To make a pledge to the Bar Foundation Fund, click here.